In the early 1950s, a 45xx small Prairie drifts into Wadebridge with Bodmin Branch No 2 set with a service from Bodmin General. The coaches (6977 + 6778) are diagram E140 and are still in their last GWR livery. Photo extract courtesy of Rail-Online. Mike Garwood's E147 in BR(W) plain crimson, prior to adding the 'I' numeral for the 1st class compartment, and based on an RCTS photograph. The numbering should perhaps however be below the waist line. The model is based on a Comet kit, but greatly enhanced by using an MJT roof section 2971L on new home-sourced etched ends. (The section supplied in Comet kits is not a good elliptical GWR contour.) Details of the build can be found on his Scalefour Forum thread. 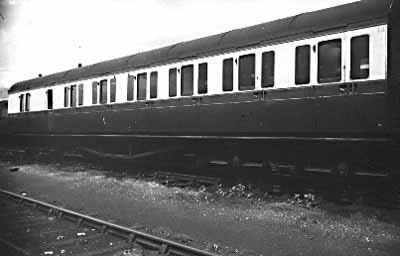 The B-set coaches of the Great Western Railway in the Bristol Division area were non-corridor brake composite coaches arranged in pairs, with the brake compartments outermost, for suburban and branch line working. The first type, lot 1327 diagram E116, was ordered at the end of November 1922 and comprised 7 pairs: 7169–72, 7510/1,74–9, 7625/6, which were completed in August 1924. Like all the others there was one first class compartment, in this case at the inner end, and six third class. Diagram E116 was 57'0" x 9'3", had flat ends, and no inner-end buffers. The inner ends were connected by a fixed link. The style of this link was probably a tommy-bar, similar to those fitted on the contemporary bow-ended D87/E124 close-coupled suburban sets, but without the buffing plate boxes used on those bow-ended vehicles. Bogies were of the 9' 'fishbelly' type. All were allocated to the Bristol division, and the brake ends branded "Bristol Division No.1" to "Bristol Division No.7". They lasted in service until 1962. A 4mm model was available from K's, but needed a lot of work to bring up to a reasonable level. It is possible to find these kits second-hand if lucky. The next type to appear 18 months later incorporated several variations. Lot 1355 diagram E129. It was a foot longer (at 58'2"), with bow ends and also ran on 9' fishbelly bogies. Five pairs were produced, numbers were 6545/7, 6551/3/6/60/1/3/5/6. All were allocated to the Bristol division. 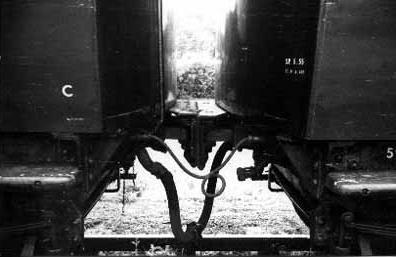 The coupling between the coaches was a channel section over a forged solid link similar to that used on Southern Region electric units. The first class compartment was moved from the inner bogie end to the fifth, leaving one third-class compartment between that and the brake. A kit for these coaches is available from Comet. March 1929 saw the completion of the next batch of four coaches under lot 1393, diagram E135, numbers 6640/1, 2/3. They were basically similar to the E129, but slightly narrower (8'10" width), and mounted on 7' bogies. They were allocated to the Bristol division, although 6640/1 were photographed at Kingsbridge in 1946 (see table below). 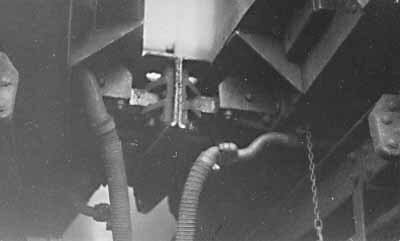 As with later diagrams, inner end buffers were fitted, of approximately 1'2" long. The largest group, diagram E140, appeared in April 1930 under lot 1407, numbered 6445–57/9–65. These were longer at 61'2", 9'3" wide. They had recessed door handles, and straight practically flat grab handles (instead of the curly 'G' handles). 7' bogies were fitted. All were built for the Bristol division. A further 40 for general traffic were constructed under lot 1445 later in the year and in the following May a further 22 were built under lot 1455, numbered 6240/1, 6261/2, 6365/6, 6371/2, 6374/5, 6656/7, 6968/9, 6975/6, 6977/8, 6983/4, 6989/90. 41 pairs were produced in all. The last were allocated to the Bristol division. This is the coach produced by Airfix, then Dapol and now Hornby. Sample brandings are given in the table below. A further 50 diagram E145 coaches were produced in February 1933 under lot 1479. With a similar style body to diagram E140, they were mounted on 9' heavy bogies and given random numbers in the in the 60, 61, 62 and 63xx series. Although built for local services, several appeared in the Bristol area. Diagrams E140 and E145 had recessed guard's doors. The last style appeared at the end of 1933, and was diagram E147. These had flat ends, 9' light pressed steel bogies, 57'0" x 9', with unrecessed door handles. 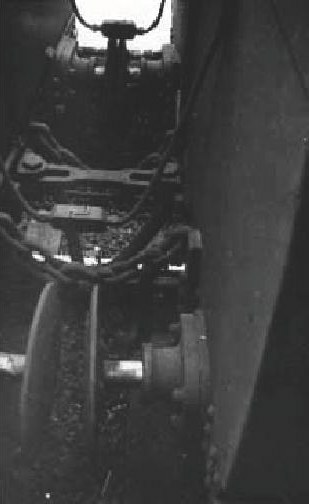 The close-coupling arrangement reverted to the style of the E116, with a slotted tommy-bar, but safety chains were also fitted. Four further batches appeared up to October 1936, lots 1393, 1505, 1523 and 1550 producing a total of 116 coaches. 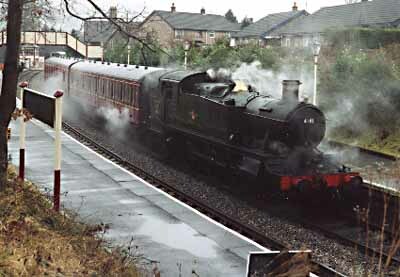 Some of the last lot ran as loose coaches in longer trains, and were presumably fitted with standard length (1'10½") buffers at their non-brake ends. Numbers were again random in the 67, 68 and 69xx series. They were distributed more widely around the system with many in South Wales. Approximately 52 pairs were produced in all, with another 10 or so running as 'singles'. A kit is available from Comet. Thirty more non-corridor brake composites were built in 1952–4 to diagram E167. These were 63'0" x 8'11", 9' light-duty pressed steel bogies. All were fitted with conventional drawgear and normal 1'10½" buffers at both ends, and worked mostly as strengthening 'singles', but some worked as pairs, so perhaps can legitmately be regarded as a 2-coach 'B-set'. Details are included in the table below. The style of the branding was white letters (about 3" high) at cantrail level on the outer ends of the sets. For set and running numbers, including those vehicles running outside of the Bristol division, see the table below. No B-sets have been preserved, but a flavour of them is on the Llangollen Railway who have a couple of non-corridor coaches billed as a "B-set". In this discussion, the brake compartment is treated as being on the right. Details of the undersides of coaches are hard to come by, so I thought some sketches I made might be useful. From my researches of diagram E140/E145 coaches, I found that as modelled the Airfix underframe is quite wrong. There are 2 large battery boxes on the nearside, with a regulator box on the far side. Castings from ABS are available for the large battery boxes, but I used some rather nice etched brass components from Frogmore Confederacy. For those without access to their kits, a drawing is shown of the regulator box. The basic underframe I used is from a Comet kit. It is possible to retain the original plastic underframe, but removing the incorrect battery box does make a mess of the truss rodding. Some dimensions from my notes; battery boxes are 8" and dynamos are 1'4" from rail level. In plan view dynamos are 1', vacuum cylinders are 6" and battery boxes are 1'3" from the edge of the chassis. The pulley on the dynamo is 1'6", and the steam heat pipe is 4–5" diameter. The Airfix bodies are wrong. The door handles should be recessed and not raised as in the model. This is correctable after considerable work. The buffer beams should be straight, and not bowed. There should not be a window by the guard's door on the far side. As supplied it has an extra first class compartment branding, the correct compartment can be easily seen with the extra width of compartment. I have scanned in some drawings from an article in the Model Railway Constructor September 1980, by R D Naylor. He does not give the source of these details, but they do seem to accord with photos I have seen. The inner ends have acquired some extra detail that should be removed (sketch attached). Some extra handrails need to be put around the guards doors, and on the ends. This drawing is in 2 halves, the "a" side is apparently the earlier period, and the "b" side later BR period. Destination board holders are shown. 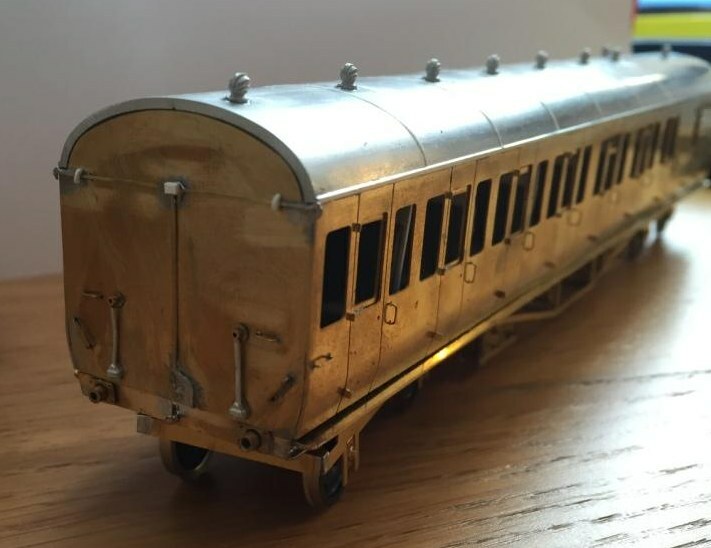 The bogies as supplied are very 'thin' on detail, and really need replacing. I have replaced a lot of the 7' bogies with 9' ready to run plastic bogies, from Bachmann and Dapol. They run very well. Branchlines nickel-silver wheels run very true, and give a satisfying sound over the rail joints. Buffers are a definite replacement on the plastic underframe. Sprung GWR pattern buffers are hard to come by, the MJT ones suffer from springs that are too strong. I have had a go with the John Hayes ideas on springing buffers in his wagon articles. The inner end of Mike Garwood's E147, showing the 'shortie' buffer stocks. For these, Mike used two types of brass rod – one with an outside diameter of 2mm and an inside dia of 1mm, the second with a 1mm outside diameter and 0.5mm inside diameter. The correct sized sprung heads can be obtained from MJT. Mike did a small etch for the back of the buffers to include the 4 bolt heads. The length of these shortie buffers is approximately 1'2". Further pictures of Mike's E147 can be found here. The table below, compiled from information by John Lewis and Mike South, gives known pairings of branded and unbranded B-sets, and includes coaches running as 'singles' with buffers of conventional length at the non-brake end. The table includes those vehicles built in the BR era. Inevitably, there are many unknown allocation gaps, e.g. for 'Llanfyllin, Llanymynech and Oswestry Branch No.1' and 'Llanfyllin, Llanymynech and Oswestry Branch No.2'. E140 1407 6461 + 6464 Helston No.2 formed circa May 1955; 6461 was previously half of (with 6460) St. Ives No.2; 6464 was previously half of (with 6465) ?? ?